It’s the August Bank Holiday weekend here in the UK and of course that means it’s also pretty rainy. Not 24/7 rainy, but rainy enough so that you can’t really spend the whole day outside (like last weekend which was GLORIOUS). So instead of hiding away under shop awnings and playing the “Is it safe to come out now?” dance, sometimes it’s better to wave your white flag, go home and curl up in bed with an Elle magazine and a cup of chai. 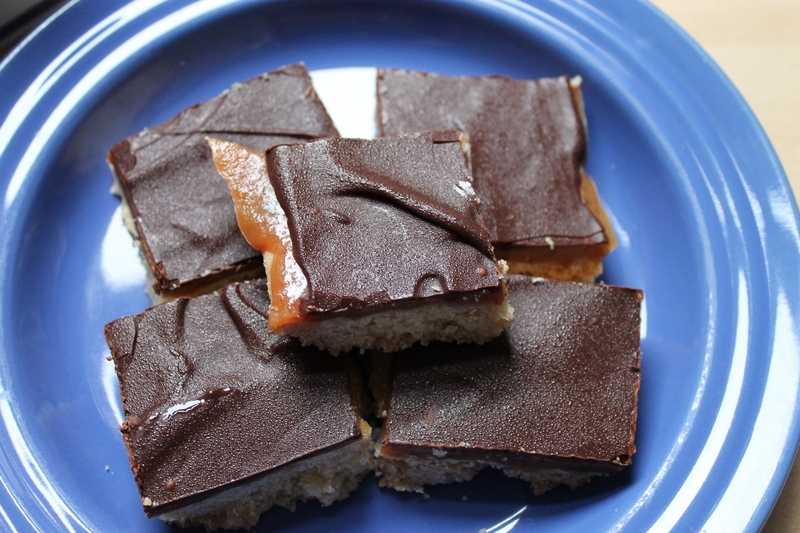 And these amazing millionaire shortbread squares. Sorry, Kabillionaire shortbread. 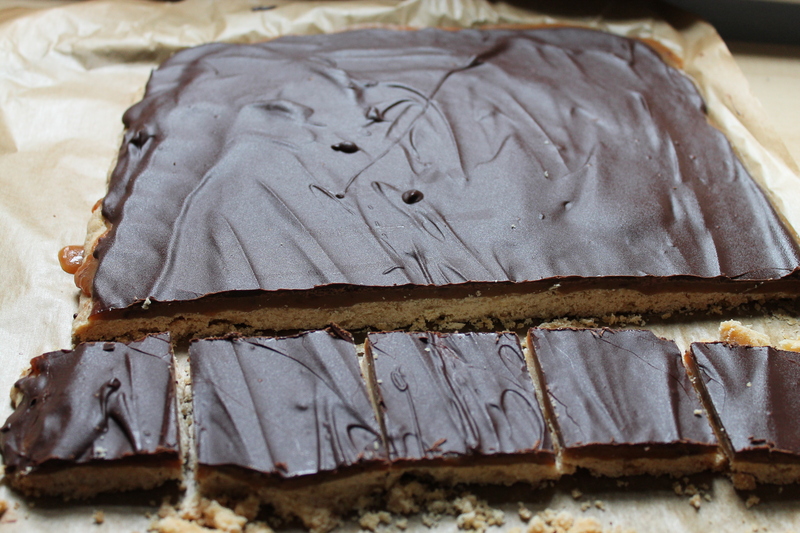 We call it that because it’s the perfect blend of buttery shortbread, chewy toffee and lovely Belgian dark chocolate. This isn’t shortbread for your ordinary run of the mill millionaire, oh no. This is the Bill Gates and Warren Buffett of shortbread. Make these today and eat whilst feeling warm, safe, happy and…well, like a Kabillionaire. Mix the flour, semolina, caster sugar and salt together. Add the butter and rub the cubes in until the mixture resembles breadcrumbs or sand. Push the crumbs together to form a smooth(ish) dough. Refrigerate for 30 minutes. Preheat the oven to 140C (fan assisted)/160C (non-fan assisted). Line the largest baking sheet/oven tray you have with greaseproof paper. Press the shortbread dough onto the baking sheet (or you can roll it – we just like to use our hands) and prick with a fork. Bake for 40 minutes until slightly golden. Leave aside to cool. Place all of the toffee ingredients into a large non-stick (we learnt the hard way) saucepan and stir over a low heat, making sure all ingredients are incorporated. Pour the toffee evenly over the shortbread. Leave aside to cool for at least 30 minutes. Cut the shortbread into squares, rectangles, triangles, etc and store in an airtight tin. Eat within 5 days and don’t forget the chai + Elle magazine. They taste amazing! By far the best I have eaten!